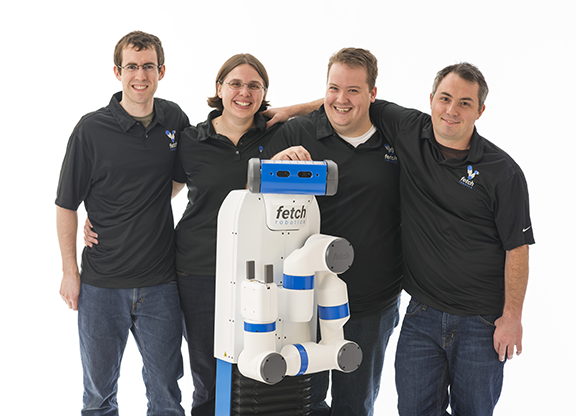 Fetch Robotics builds robot systems for the logistics industry. The company was founded in 2014 and is headquartered in San Jose, CA. Unveiled in April 2015, the Fetch Robotics system is comprised of a mobile base (called Freight) and an advanced mobile manipulator (called Fetch). 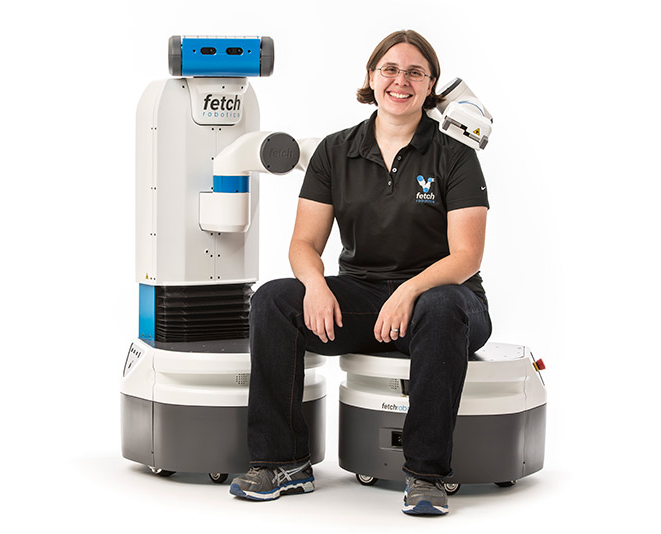 Fetch and Freight use a charging dock for autonomous continuous operations, allowing the robots to charge when needed and then continue on with their tasks. In addition, the system includes accompanying software to support the robots and integrate with the warehouse environment. The robots are designed to work independently alongside human workers, performing repetitive tasks such as warehouse delivery, pick and pack, and more. Fetch was awarded a GameChanger award by Robotics Business Review for Best Industrial Productivity Solution. What’s the current value proposition for Fetch Robotics? We see the largest opportunity within the logistics and material handling industry. E-commerce and an on-demand economy are putting tremendous pressure on inbound logistics and fulfillment. If you look at the top issues for logistics managers, there are several different types of issues that they’re looking to tackle. One is throughput, obviously. Another one is insight into the day- to-day happenings of the warehouse. Logistics managers are making decisions based on data that is sometimes almost a month old in many cases. Lastly, being able to add technology into an aging warehouse. Those three things are what we’re trying to capture at Fetch. How did you identify logistics managers as your alpha customers out of the whole range of service robotics? We first decided to focus on the logistics market as there is a great deal of supporting evidence that the market needs to turn to automation. One obvious indicator is that the market is changing. There’s a lot more demand for instant delivery, or express delivery, same day delivery, same hour delivery. Businesses somehow have to get goods from a warehouse to a person’s hands in a shorter amount of time. The other factor is the current job gap. There are about 600,000 unfilled jobs in this industry and most people estimate that’s only going to get worse. How many trials does Fetch have underway? Right now we are working on three different commercial pilots, all at different stages. We can’t say much about them just yet but we are in the process of doing commercial deployments. We’ve also sold several robots into research, which is also a means for us to hire as we grow. If we get robots into research labs then students are already familiar with our robots. So that’s not so much a sales channel as a recruitment channel. Looking at your commercial customers, what would you say are the similarities and differences? Some of our current customers just want to use the software and the robots as we’ve imagined them in our videos. But others want us to change it up a little bit and do point-to-point delivery or have robots going between people instead of robots following people. There are a lot of options. Some of it is nonrecurring engineering work and some of it isn’t. Lastly, the logistics market in general works with such thin margins. They have to increase productivity or risk losing margin. Right now we aren’t specifically offering robots as a service. We are doing engineering work to customize the robots. In terms of our business model, we’re still coming to a final solution on our pricing strategy. We have already seen that some potential customers prefer the capital costs of buying the robots, where others would prefer them as a service. What would a typical deployment of Fetch and Freight look like in the future? How many units of each and how would it integrate with existing systems? Right now follow-pick is our most popular kind of product, wherein our Freight robot simply follows an individual in a warehouse. Our customers and prospects are still looking at the problem. Do they want better transparency into their warehouse? Do they want better throughput? How much more throughput do they want? How big is the warehouse? How many people do they have picking. So there are a lot of factors determining what is a standard system, meaning that essentially there is no standard system. We’re also trying to find ways to talk about it like robots per square foot or robots per employee but we’re not there yet. We seem to find it easier to imagine robots that augment human workers, like Freight, perhaps Fetch is too big a step? It’s very possible that Fetch is going to be an incremental step because of the discomfort some businesses have regarding automation. When you look at Fetch versus Freight, Freight is a lot more understandable and businesses have a better understanding of how it translates directly to productivity. When they look at Fetch they wonder why it looks that way, how many picks it can do, how accurate it is, etc. When you’re talking about a robot that just follows you, it’s much simpler to understand. At this point, we’re not worried. We’re going to work with our customers to help them understand the capabilities of our robots and we believe that we’ll get more traction in the future. Can you describe Fetch and Freight, what they do, what they cost and what the ROI is? Fetch and Freight are a pair of robots. When they’re working autonomously they’re most often working as a team. Fetch is a mobile manipulation robot. It has an arm and can pick up objects weighing up to 6 kilograms. Fetch can navigate autonomously, search out objects on shelves and pick them up. Freight is a mobile robot. It’s meant to do most of the freighting or transporting in a warehouse because fifty percent of a picking task is transport. We decided that when you look at the cost of making Fetch vs. Freight, it’s far more inexpensive to make Freight. Fetch is more sophisticated, more like a person. Like a person, when Fetch isn’t picking then it’s under-utilizing its capabilities. That’s why we developed this buddy pair. In terms of cost, we’re really not talking about that yet. The cost of the system is extremely dependent on the size of the system, the volume of the order, how many warehouses it’s going into and all of that. All of those things factor into pricing our robots. What is the ROI for a warehouse? We’re positive that it’s less than two years but don’t yet have data yet to effectively support that. What so far is staff response to it? We haven’t really gotten past novelty yet, so we’ll see. What are some of the issues you’ve faced in deployment? Most of the issues we’ve faced involve migrating from existing back-end systems. Warehouse systems are a hodgepodge of different technologies. Do you have specific lessons from these deployments? Has that lead to changes in what you’re doing? Not yet. We haven’t been deployed for very long, so we’re trying to not make any preliminary conclusions. What is the competitive market? There is very little that is a mobile manipulator but there are quite a range of mobile solutions, presumably in warehousing as well as other service areas? Can you describe how you differ? This is really a hard question because its more about the software than the robots. The hardware is very similar. We know that we are more price competitive, but it really comes down to the software that we’re using. And what about the difference in timing? Whether or not you are serving legacy hardware or not? Legacy is a big problem for the industry. What are the environmental factors that contribute to Fetch that might not have been possible five years ago? ROS, definitely. It certainly helped that many of the core members here at Fetch were also on the ROS core team. Sensor technology has come quite a ways. Also, the way we think about doing things has changed significantly because computational power has finally caught up with some of the algorithms. A really great example of this is particle filters. Our use of particle filters for localization has been limited so far, to using a small number of particles, because of the computing power needed to do the algorithm for a certain amount of particles. The moment you wanted to add thousands and thousands of particles it wasn’t practical. But now computing power has gotten a lot more powerful and so some of the things we thought about previously but couldn’t implement because of the limited computational power, well now we’ve changed our thinking significantly. We’re starting to use that computational power more effectively to do interesting more novel things, which improves things like better localization. What new areas will that open up for robotics? We’ll be able to use more computationally- intensive algorithms that might produce better visual or navigational results, more natural behaviors, more clever solutions. From my perspective, it’s one of these things where technology seems to be time capsuled by the technology that was available at the time it was created. Robotics is specifically susceptible to that because it’s so dependent on new sensors and increased computational power. Until everything gets sufficiently fast or powerful you’re always going to have this legacy problem where we did this because of x, y or z limitation at the time. Let’s assume that we’re reaching a point where our technology is able to meet the needs of service robots like Fetch and Freight? Where do you see future potential? I think there are market opportunities, specifically in elder care. Everyone sees that as the next big thing. The challenge there is whether we’re going to be able to get around the safety issue. There are a lot of edge cases and I just don’t know if we can do it. We also haven’t done the same legwork that we’ve done in logistics, so it’s hard to nail down where we want to go next. Logistics is pretty broad? At the moment you’re targeting e-commerce warehouses, are there other applications in logistics? We’re going to look at light manufacturing: robots actually doing the assembly or the value-add tasks. And that’s actually more specific to Fetch rather than Freight, although perhaps Freight can value-add too. I expect there are some value-add services where the robots can probably extend into after logistics. There’s one key thing, people are not necessarily great at walking compared to everything else we do well—excluding the health benefits—walking is not a high value activity for people. Finally, are there messages that you’d like to get out about Fetch and Freight? We’re trying to make it clear to the world that Fetch Robotics is providing solutions—both collaborative and autonomous—for the logistics space. We don’t want people to think that our robots just do x and y. We’re hoping to engage people in the idea that we can create new applications and capabilities for these robots, to extend them beyond what our initial vision has been. The rest of our free report is available here — or in installments at Silicon Valley Robotics — featuring case studies and analysis from industry experts and investors.